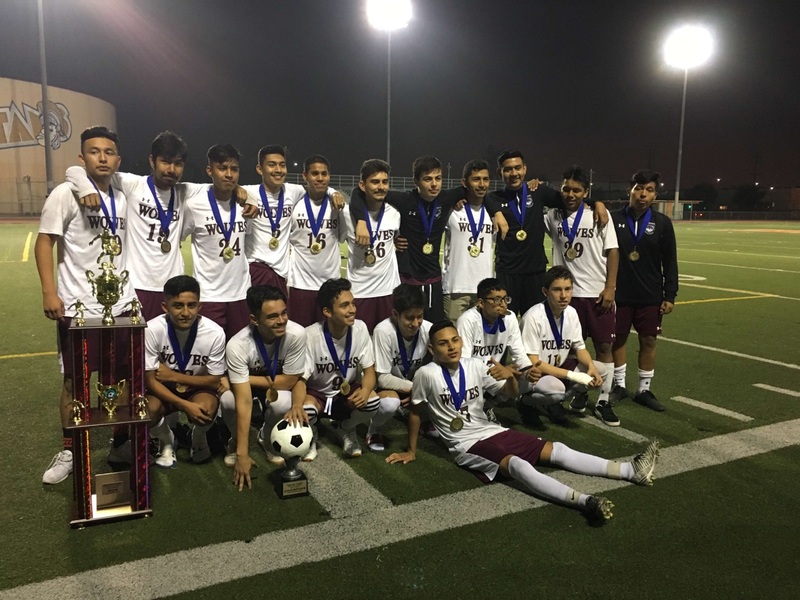 Sotomayor Wolves Soccer team played Fremont High School for the semi-finals in the California Interscholastic Federation (CIF) Championship on February 27. The rain didn’t stop the boys from beating Fremont High School with a score of 3-0, in penalty shoot outs. The Sotomayor Wolves soccer team players are more like a family. When they play on the field they communicate well with one another, even off the field. “We see each other every day and we have practice every day. We never leave anyone out and we treat one another how we would want to be treated. We go to the movies, shop, and go eat together as a group,” striker Bryson Arevalo said. Everyone on the team gets along, which is beneficial when it comes to games. The team is lectured during halftime at a January 6 game. “We work harder and practice harder than any other school. We wake up early on school days to get to campus at 6:00 a.m and practice till 7:20 a.m, then we practice after school from 3:30 p.m to 6:30 p.m.,” Arevalo said. Jose Servin, a right back for the Sotomayor team confirmed the team’s constant practicing regimen. “When you guys are on spring or winter break, we [the Soccer team] are practicing,” Servin said. The semi final game for the CIF Championship on Tuesday, Feb. 27 went on from 3 p.m. to 5:50 p.m. The crowd was anxious as the Sotomayor team kept missing their target and the score remained at 0-0, so the game went into overtime which is two halves, 15 minutes each. Then after overtime, the game went into golden goal which is when a team is tied at the end, therefore they do a sudden death match where the next goal wins. Still both teams weren’t able to make a goal so the next alternative was penalty shoot outs. Fremont High School Soccer team missed the three penalty shots they had, but the Sotomayor Wolves made three out of the four penalty shots they had. Sotomayor Wolves huddled in a circle before their game on Feb. 22. “I felt good when we won the game because it puts us closer to where we want to be,” Arevalo said with tears in his eyes. The CIF Championship game will be on Saturday, March 3 at L.A. Valley College and they will be competing for the championship title with El Camino Real Charter High School. The Wolves soccer team are all eager to win and get the championship ring. They hope their hard work and dedication will get them there, and maybe someday become State Champions.